He made this comment in regard to the concept and importance of marriage to members of the priesthood in the General Priesthood meeting. I have witnessed many different marriages and divorces - even subsequent marriages by those who have already ‘been there and done that.’ Sadly, we’ve heard much reported lately about married, powerful, well-known men who have had affairs and, as a result, caused all sorts of damage to their families and communities. Rather than define marriage or discuss problems caused by infidelity, I’d like to share my personal experience with marriage and why I agree with President Monson that once you’ve made the commitment to be married you should love your choice — both your choice to be married and the person you married. I had the privilege of traveling with the BYU Young Ambassadors for three years while I was in college. I thought, even hoped, I’d find my eternal companion among the ranks of that talented ensemble. But alas, it wasn’t to be, and I’m certainly grateful for that. After college I spent a couple years chasing my Broadway dream in New York City, working to support myself and continuing to sing, dance and act when given the opportunity. Then, at a fortuitous moment, a job at BYU’s Performing Arts Management office opened up. I applied and was ultimately offered the job. I purchased a townhouse in Orem, Utah and ended up attending the single’s ward where my future wife went to church. 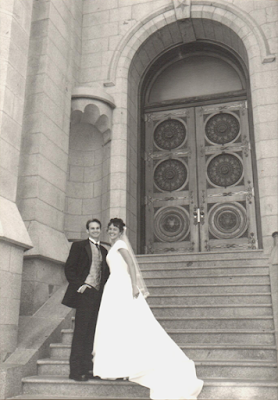 I was twenty-nine when we married - older than most in the LDS faith. I had stopped praying that I’d soon get married and instead prayed that I wouldn’t miss the opportunity to get married - that I’d recognize the right woman when I found her. After the first date with my wife, I went home very excited. Although I wasn’t sure what she was thinking, I felt very strongly that she was someone I could marry. And, as it turned out, she had similar feelings. We were married in the Salt Lake LDS Temple eleven months later. President Monson encouraged the men to be humble, saying there’s no place for pride in marriage. It’s my belief that marriage is strengthened by a personal commitment to the gospel of Jesus Christ, where the atonement of Jesus Christ is applied, allowing us to frequently repent, forgive and move on. Being married may not always be easy, as it requires the best of both of you, but it makes you better. I can’t imagine being married to anyone else. The timing was perfect: the right person at the right time in the right place. What President Monson said is good counsel: choose your love, then love your choice. You love your spouse when you become the best you can be and are more concerned about them than you are about yourself. To my sweetheart: I’m glad you choose me, and I happily choose to always love you! This post was originally published June 10, 2011. Image: Pete Codella (used with permission).